From Revolutionary History, Vol.2 No.1, Spring 1989. Used by permision. The Minneapolis strikes of 1934 have always occupied a special place in the historical understanding of the Trotskyist movement, as they were the first clearly documented demonstration of the ability of a small Trotskyist organisation to make the breakthrough into the broader labour movement, and to lead one of its sections to victory. Along with the Toledo Auto-Lite struggle and the San Francisco General Strike, they formed part of the revival of the industrial militancy of the working class of the United States from the depths of the slump. They have always been regarded as a model by Trotskyist organisations throughout the world. Every effort was made by the leaders to give these natural abilities an opportunity to come to the surface. No stone was left unturned in the attempt to do this, Something more than numbers is required on the picket line. The men must feel that their efforts are well spent, that they are a part of a smoothly functioning machine, that they can successfully hold every position they win. To stimulate and justify this confidence the leaders must perfect a thorough organization and all preparations must be carefully checked to the most minute detail. That was done in Minneapolis. From the inception of the organization work in connection with the General Drivers strike, it was correctly estimated that our strategic position was the so-called central market place. This takes in an area of approximately six square blocks. It is bounded on the one whole side by the railroad tracks, which are the team tracks where practically all of the market produce is unloaded. But on Friday the bosses began their offensive. Cops began to arrest pickets by the dozens. A few trucks under heavy police guard pierced the picket lines. The yellow press began to denounce the strikers, who were trying to get decent living conditions for themselves and their families, as lawless elements. Abuse was heaped upon them by all the agencies of the Citizens Alliance. The workers began to realize the seriousness of the struggle and settled down in real earnestness to the task confronting them. Early Monday morning hundreds of pickets assembled at the market armed with clubs, rubber hose, and other improvised weapons. They were no longer a mass of strikers, they were soldiers obeying orders from their captains. Police attempted to disperse the pickets and the fight was on. The strikers rushed the cops, who went down like nine-pins. After considerable fighting the cops drew their guns and threatened to fire. The workers showed their defiance. But the cops had had enough and asked the pickets to drop their clubs, saying that they would drop theirs. The strikers were not fooled by this and stood their ground. No trucks moved that day. Still another was so badly beaten in the Tribune riot that all old operation lesion opened up, and there is danger of internal hemorrhages. Still another was beaten across the arm with a billy. She is still carrying her arm in a sling. The newspapers of Minneapolis, being the instrument of the Citizen’s Alliance, were muzzled to such an extent that no news in favor of the strikers was ever published. To attempt to counteract this state of affairs, the women organized a mass demonstration. We marched from the Auditorium on Grant and 14th Streets straight down Nicollet Avenue. Led first by four women carrying our banner, followed by about 500 women, many of them sympathizers, we broke every traffic rule in Minneapolis. Crowds gathered along the sidewalk and followed the procession to the court house. In closing let me emphasize again. Let your women work in this class struggle. Their place is right along side of the men, shoulder to the wheel, fighting for their birthright. 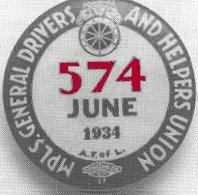 The Women’s Auxiliary of General Drivers’ Union No.574 has set an example which we hope will be followed by the working class women throughout the nation. The Communist League has always followed the policy in the trade unions of working with all progressive forces to be found in the organizations. Its trade union policy has been proved in action. Today there stands, confronting the bosses, a mighty union which organized the picket line that fought off and routed the police and the armed bands of the Citizens Alliance. In the early 1920s the bosses started the open-shop drive. They formed the Citizen’s Alliance whose only aim was to keep Minneapolis non-union. The bosses were successful in carrying out this program up to 1934. In fact, they were confident that no one could ever lead a drive to unionize the city. We were convinced the employer would never recognize the union without a bloody battle. Consequently we made all possible preparations and were extra careful to proceed legally – appearing before the Central Labor Union, the executive board of the drivers union, and the Teamsters’ Joint Council. The response from these bodies was to throw a wet blanket over our proposal. After many hours of negotiations, a contract with recognition of the union and a small increase in wages was presented. The big question at issue at that time was our right to represent truck drivers, helpers, and inside workers working for each employer. This issue was scuttled, and finally a paragraph, very ambiguous in wording, was accepted with the guarantee of the governor that it meant the right of the union to deal for all the mentioned classifications. On this basis the strike ended after ii days.